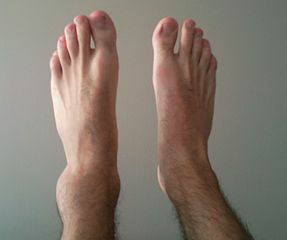 Side-note: Obviously anything worst than a sprain should prompt you to see a doctor immediately. This first thing you want to do differently is avoid wrapping or compressing the joint. This will prevent the drainage of excess fluid in the injured area, which may prolong inflammation and discomfort. Next you will want to still elevate your injured ankle above your heart level so that it may rest and allow for proper drainage of fluid. While your ankle is elevated, spell out the alphabet with your foot as often as you are able to. If the pain is too serve, just wait until you are able to move your ankle through its normal range of motions. The key is to do this as soon and as much as possible to promote fluid drainage and prevent any build-up of scar tissue. Optionally, you may attempt to flex your toes until you are able to move around your ankle. The next thing is to use contrast therapy with hot and cold water, along with the above mentioned exercise. You may either fill one bucket with hot water and one with cold water to alternate between, or even use a pack of ice and place your joint near a heater in case you don’t have buckets large enough to house your ankle in. The goal is to supply a temperature that is as hot and as cold as you can tolerate. You will want to alternate between hot and cold every 2 minutes, for 3-4 cycles… repeating this every few hours up to 3-4 times per day. (speaking from personal experience I've sprained my ankle twice so far really badly, and this helps so much, the pain entirely disappears after awhile of doing this alone, highly recommend!) While in the hot water attempt to spell the alphabet with your foot, and while in the cold water rest your foot completely. If your ankle is still swollen, then end this cycle with 2 minutes in cold water… otherwise end the cycle with two minutes in the hot water. The point of this is to increase the size of your blood vessels with exercising in the hot water, and contract them while at rest in the cold water. This creates a pumping effect, which can help drain the fluid and reduce pain much faster. As soon as you are able to, try to put some weight on your injured leg. At first, you will want to do this while remaining seated. It may take a while before you are able to walk normal again, so don’t rush it unless you’re willing to let it heal improperly. If you are attempting to walk using primarily your good leg, then you should stop until you are able to put more weight on your injured leg or use either crutches or a cane in the meantime to prevent any further injury. Putting too much weight on your good leg may cause an injury to the ankle, knee, and/or hip of that leg. Walking on your injured leg as soon as possible can activate the nerve fibers in your ankle that control your joint-position sense and balance, which is a good thing. Repeatedly activating these nerve fibers can help restore strength to the surrounding ligaments and muscles, restore function to the soft tissues, as well as promote better blood flow. The main thing to remember is not to create significant discomfort as you recover; this is a sign that you are aggravating the injured tissues, which can prolong your recovery time. Your diet also matters during the initial phase. It’s recommended to not eat or drink anything cold, since it will slow down your entire body’s blood circulation and thus the healing process. Additionally, there are a number of Chinese herbs available that will help you heal faster either by ingesting or applying on the skin such as: Mugwort, Tumeric, Lemon grass oil, etc. After the first few days, when most of the swelling has gone away, you may want to soak your ankle in warm water that has Epsom Salt in it for 15-20 minutes at a time. This will also help circulate the blood while relaxing the muscles due to its magnesium and sulfate composition. It also is able to help reduce inflammation and pain, although not as effectively as the contrast therapy in the beginning. Add about two cups of Epsom salt to a bath or about a cup to a smaller container used to soak your foot separately. Also, having someone massage the injured area (or even self-massaging) can be helpful to move the blood around, as long as it is not causing pain. Please click here to watch a video providing some tips for self-massage vs. someone else massaging your ankle.